While studying art history in graduate school, novelist Nicole Krauss spent hours in the library researching Rembrandt, only to find that she preferred imagining the details of his life instead. "Beyond looking at his paintings, no amount of research would ever take me there. But a novel might," Krauss said. Krauss's vivid imagination has resulted in three critically acclaimed novels: Great House, The History of Love, and Man Walks Into a Room. 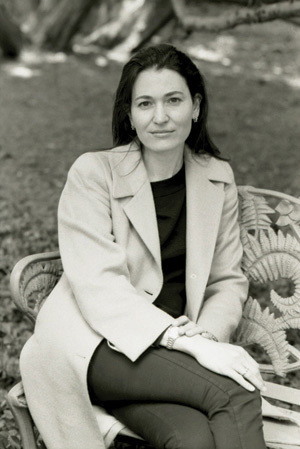 Krauss was named a National Book Award Finalist for Great House, her most recent novel. In 2010, The New Yorker named her one of the 20 best writers under 40. On Tuesday, September 20, Krauss appears at the Harry Ransom Center, where she will read from Great House and speak with James Magnuson, Director of The University of Texas at Austin's Michener Center for Writers. A live webcast of the event airs on Tuesday, September 20 at approximately 8 p.m. EST/7 p.m. CST. I spoke with Krauss about her thoughts on art, what she's currently reading, a Rembrandt self-portrait that reappears in her novels, the burden of inheritance, her advice for writers, transplanted rooms, and more. Alma Singer from The History of Love shares the same name as the wife of Isaac Bashevis Singer (whose archive resides at the Ransom Center). Your works have been compared to those of Singer. Did you deliberately name Alma after I. B. Singer's wife? No, that was a happy accident. I wondered later whether it was an unconscious decision, but I don't remember ever learning that her name was Alma until after I finished the book. I cast around a lot for names in the beginning; it's difficult to name a character because almost every name feels artificial. I had chosen Singer because it was the name of someone I knew when I was the character's age, 14, so it seemed natural to me. Alma just rolled off the tongue in the right ways. And of course it has all these wonderful meanings. It was a beautiful name, and it sat well with me. So I put the two of them together, and that was that. Strangely, Isaac Bashevis Singer was never a big writer in my life. I still haven't read many of his works, though I mean to. It surprised me that that book was compared to him so frequently. When David Grossman wrote his first novel, everyone told him that he had been influenced by Bruno Schulz. But he'd never heard of Schulz. He sat down and read him and had to agree. You mention the same Rembrandt self-portrait in both The History of Love and Great House. In The History of Love, Uncle Julian says "there's a serenity in his face, a sense of something that's survived its own ruin." In Great House, Arthur says he associated the portrait with the phrase "a ruined man." That's interesting. You're the first person who's noticed that. I didn't even notice that, though I knew that I had mentioned it in the other book. Obviously, it's an important painting to me. It will probably end up in other novels as well. Rembrandt is an artist whose work I've thought a lot about. I did a Master's in Dutch seventeenth-century art at the Courtauld Institute in London, and I wrote my thesis on Rembrandt. I've always been moved, especially, by the late self-portraits as they get more and more honest. In the early self-portraits, you have this painter who's putting on airs and costumes, modeling himself as a wealthy burgher or a famous artist, but he's really just a young, scrappy, ambitious guy. And then late in his life, once he's bankrupt and alone, there come these amazing self-portraits that are quite brutal, frank, and unadorned. You feel a hurriedness in the brushstrokes. He's scratching into them with the back of the brush. You feel the sense of someone facing his death. Obviously, that's a position that I am drawn to in my work. A number of my characters have been older people who are confronting the end of their lives, the final calculation of who they were, how they lived, their mistakes and regrets. I lived near that particular painting I mention, which hangs in Kenwood House in Hampstead Heath. I used to walk on the Heath daily, and you can visit Kenwood House without paying. You could go in everyday if you felt like it, which I often did just to see that painting. I guess you could say that I have a long history with it. In your Huffington Post essay on writing Great House, you say that Weisz came out of your interest in transplanted rooms, specifically those of Freud and the painter Francis Bacon. This strikes a chord here at the Ransom Center, where there are two transplanted rooms: the study of Fleur Cowles and John Foster Dulles's study and living room in D.C. I realized at a certain point that there were some preserved rooms that I had always been drawn to in my life. I became fascinated with Bacon's studio partly because it's such an extreme example, such a complex room. He was infamously messy. He left everything wherever it dropped, so the studio was full of thirty years of stale sandwich crusts, half-drunk bottles of alcohol, old clothes, garbage. He kept this huge archive of photographs, but they were all crumpled up on the floor. There was a kind of violence to the mess, sometimes literally; he would slash a lot of his canvases. Over time, he wore paths through all of this material. For whatever reason, after he died his studio was moved from London to Dublin. You can imagine the archeological work involved with breaking it down into tens of thousands of pieces and then reconstructing it. I was drawn to the question of whether such a transplanted room retains its original power. Is it even the original, or is it a kind of simulacrum? It's exactly the same, only it's been taken apart and put back together, and now it's in a new place: an uncanniness has been introduced. That made me think about Freud's room in London, which I lived near and also spent a lot of time in. It was a comforting place to me, as you can imagine Freud's study might be for anyone [laughs]. I was thinking about how his wife and daughter tried to make upheaval easier for him by creating a replica of the study he had left behind in Vienna. When he died the following year, everything was left exactly where he last put it down, frozen in time, the glasses on the desk and all that, obsessively preserved until now. I wanted a room of my own like that to experiment with. I was curious about the urge to preserve or reconstruct such a talismanic room. Weisz's room--his father's study in Budapest which is dismantled by the Nazis and which the son spends fifty years reconstructing in Jerusalem--became a way of experimenting with that. I once listened to a graphic artist give a presentation about a book he was working on, all of which takes place in the living room of his childhood house, and the book stretches from prehistoric time into the future. He built a little model of it so he could figure out how the sun would move through it. I remember thinking that that was similar to what I did with Weisz's room. Only I wasn't interested in how the light moved through it. I was interested in something else: what does it mean to try to recreate what has been lost, and can one ever recreate it? There remains the question of what's missing, the imperfection that can't be gotten around or erased. And what about those who instead reinvent themselves in the face of loss? And is recreation always a form of reinvention? I wanted to experiment with that idea, and I wanted to see what was at the bottom of my fascination with it. Did you find what was on the bottom? I found lots of things. One of the things I love about writing novels is that you realize that you're not all that interested in the bottom. You're more interested in things that are bottomless. You become fascinated by the questions, and the answers to those questions are secondary, if they become important at all. It's really about posing questions. Great House is a novel about uncertainty, ambiguity, and doubt almost more than anything else, what it means to commit to a life regardless of those conditions. The desk in Great House also strikes a chord at the Ransom Center because we have the desks of Edgar Allan Poe, Evelyn Waugh, John Fowles, and others. You've said that your desk is similar to the desk in Great House, but you didn't realize it until later. Yeah, you want it? I'm trying get rid of it [laughs]. It's pretty big. It was a desk that was in the house I moved into. It was built by the house's former owner to his esoteric specifications. It's a bulky desk, overbearing in every way. It extends all the way up the wall. It has all of these shelves and drawers. But at least for a while I was completely unaware of its echo in the book I was writing it on. At some point I realized, of course. Not only the physical resemblance, but that I was writing about inheritance. I didn't realize until much later than I should have because the mind has a way of guarding itself from the origins of what it's fictionalizing; otherwise it would be hard to have the balls to write about much of anything at all. The mind obscures, especially, the psychological origins of the work, I find. Later one discovers them. My desk has always been almost comically burdensome to me because in order to get rid of it, which I always toy with the idea of doing, I'd have to have it destroyed (it's on the top floor of the house and there's no way to get the monster down the stairs). That always felt too wasteful to me. So there's the absurd tension of not wanting it but feeling somehow bound to it. On top of all that, the former owner built it around this painted panel which he wrenched out when he moved out, so there's this large, gaping hole in the desk right above my head, which has taken on obvious symbolic meaning to me [laughs] and which I still, daily, write under. All the same, it did me the good turn of giving me a means to approach a graver concern lurking below, having to do with the burden of the emotional furniture we inherit and pass on to our children. In other words, it gave me a novel, and so now I'm stuck with the thing, unless you want to come and relieve me of it. In your essay, you described this phenomenon of not realizing until later the origins of what you're writing about as a "blind spot." Have you found examples of other blind spots? I'm not drawn to writing autobiographically because it cramps me and comes at the cost of the freedom that writing otherwise allows--to go places that I haven't gone, to invent, to experiment, to imagine, to push boundaries. But if I stray too far in that direction, then the work loses the urgency and necessity of the personal, and in the end it doesn't work or come fully alive for me. So it's a delicate balance, and there is very often that moment of revelation when I become aware of the ways in which my fiction reflects my own experience, or how it evolved from certain interior conditions or needs. It isn't always a direct reflection, it's rarely one-to-one, but there is always a moment where I become aware of the correspondence. We've talked about your interest in transplanted rooms and writers' desks. What's your experience with archives? I'm not a big researcher. When I was in graduate school in England, I found myself always bumping up against the same wall. I'd spend a lot of time in libraries, reading and aimlessly semi-researching, but then my mind would start to improvise. When I wrote about Rembrandt, for example, I found myself wanting to makes claims about interior life, or at least trying to imagine it. But beyond looking at his paintings, no amount of research would ever take me there. But a novel might. I'm often asked about the research I've done for my novels, but the truth is that I did very little. Most of the places I've written about I know intimately; in the case of Chile, which I don't, I went through an intense period of reading about the nightmare of the Pinochet regime long before I ever thought about writing about it. You might say that in the end, writing about it was the only solution for me. A novel grows to fit the author's concerns. "The Birth of Feeling" section of The History of Love reads: "Having begun to feel, people's desire to feel grew. They wanted to feel more, feel deeper, despite how much it sometimes hurt. People became addicted to feeling. They struggled to uncover new emotions. It's possible that this is how art was born." How does this reflect your views of art? There are moments in one's reading when one encounters a passage that so precisely captures some aspect of existence, great or small, never previously articulated to you, but which you instantly understand and recognize nonetheless. It's a little shocking, and it's joyful, and one feels, suddenly, access to the underpinnings of everything. I think art is that--an enhancement, often a spiritual one. Tell me about your visit to Israel in 2010 for the Jerusalem Cultural Fellowship. I understand you met with Yoram Kaniuk. This was a pilot program, an academy at a wonderful place, Mishkenot Sha'ananim, where a small part of Great House takes place. It was the first settlement outside the walls of Jerusalem; nobody wanted to live outside the walls of Jerusalem at the time, in 1860, because it was so dangerous, gangs of marauding bandits and so on. In 1973 it became a place where artists were invited to stay and work, and now it's one of the most beautiful places in the city. All kinds of writers, artists, and musicians have stayed there. [Saul] Bellow had a residency there. It's likely that Singer stayed there at one point or another. Basically the director had the idea of reviving those residencies. It was a wonderful place to be, especially since I spent so much time in Jerusalem growing up. Unlike Israeli writers like [David] Grossman, Amos Oz, Yoel Hoffmann, or others I've been reading for a long time, I hadn't been familiar with Kaniuk. I stumbled onto one of his books in a bookstore, as one used to do [laughs]. It was called The Last Jew, and I couldn't resist the title. I picked it up, and there was this incredible endorsement on it from Susan Sontag who said of all the books in translation she'd read, Gabriel García Márquez, Peter Handke, and Kaniuk were the greatest, or something along those lines. So then I had to read it. It's an incredibly complex book, demanding in all kinds of ways, but absolutely remarkable; it's like nothing else I've read. After I read everything of his that I could find, I got to know him in Israel. He's a warm, old, cantankerous, stubborn, complicated soul and an incomparably great writer. It depends on who the writer is. Writing is incredibly hard work. Thinking itself is hard, and growing harder and harder under the tyranny of technologies of distraction. Writing, which is an elevated form of thinking, is even harder, and doing it in a sustained way over the course of a few years isn't exactly a walk in the park. People often ask about the physical details of how a writer works--where, when, with what mechanism--as if it will reveal some hidden mystery as to how it's done. But all of that is, of course, largely irrelevant. So, to begin with, writing requires time and tremendous will. Just to do it regularly, to persevere and not give up. The other necessary element, for me, is freedom, a spirited conviction that you are going to allow yourself to do whatever you want to do in the work, however unpromising or ill-advised it may seem. I sometimes wonder whether the atmosphere in which so many young writers start off, in writing and MFA classes, isn't problematic for that reason. Before their work is even finished it's put before a jury of their peers. If I had to submit my work to such a jury once a week, to any jury, I'd have to spend the rest of the week resuscitating the stubbornness that keeps me writing. It takes a certain courage, or perhaps just obliviousness, to pursue things that feel risky or poised to fail. But in my experience, it's those efforts that lead to the most interesting things, the things that I end up sticking with and which take me places that feel most worth going to. The Sermon and Other Stories by Haim Hazaz, who was the first writer to win the Israel Prize. This summer, I read a lot of Tove Jansson, a Finnish writer most famous for her books for children, the Moomintroll series. But later in her life she started writing books for adults, and The New York Review of Books has recently been publishing them in English. The Summer Book is wonderful. It's about a grandmother and her granddaughter on a remote Finnish island. This girl's mother has died, but that's never spoken of. It's only reflected through the very unique relationship between this stubborn, unconventional older woman and the young girl, equally stubborn, and the unusual things that absorb their attention. Jansson is also one of the best nature writers I've ever encountered. Who are some of the writers you admire? Bruno Schulz, [Franz] Kafka, [Samuel] Beckett, [Saul] Bellow, [Georges] Perec. In the last few years, I read all of Thomas Bernhard and became consumed by him for awhile, fascinated, in particular, by his penchant for upsetting or offending people; it runs so contrary to the contemporary American climate of appealingness, charm, lightness, of all that goes down easily. There are also poets who matter very much to me. Yehuda Amichai and the Polish poet Zbigniew Herbert both impacted me deeply when I was younger and taught me something about the kind of writer I wanted to be. To remind myself, I still return to them. Elana Estrin is a features writer at the Harry Ransom Center.